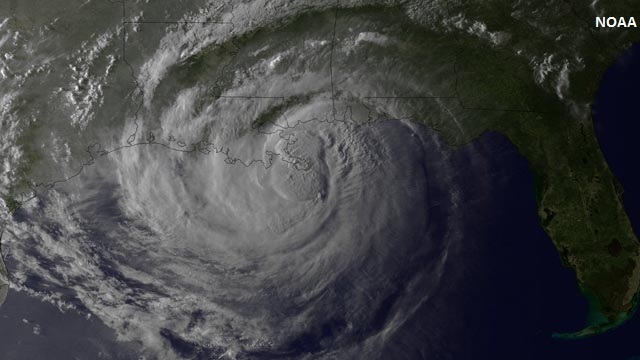 As Tropical Storm Isaac gained strength in the Gulf of Mexico over the weekend Anderson flew from the Republican National Convention in Tampa to New Orleans. On Tuesday, shortly after 11 a.m. CDT Isaac was upgraded to a Category 1 storm according to the National Hurricane Center. At 6:45 p.m. CDT the National Weather Service Doppler radar indicated that Isaac made a first landfall along the coast of southeast Louisiana in the marshland of Plaquemines Parish, southwest of the mouth of the Mississippi River, with maximum sustained winds of 80 mph. After wobbling back over the water near the mouth of the Mississippi River, Isaac then made a second landfall at about 2 a.m. CDT near Port Fourchon, 60 miles southeast of New Orleans, according to an early morning update by the National Hurricane Center. Hi Anderson, I wish you can get out before this election and come vist the people that are not spoke about, the people that are not even talked about unless they are speaking about the poor people in the USA! I dont consider myself poor, I work every day. I have a daughter that starts her first year of college this fall and I am pushing on because I would love to see someone from this poor family become successful in the USA. My grandmother worked all of her life and at the age of 87 she cant get a homehealth aid under her health insurance. I have 4 generations of college Grads in this family and why is it that we are still waiting for that American Dream. I pray that someone I am reaching out to will visit my community and see the struggel we the poor people go threw on a daily basis and I dont belive thier is no Rep or Dem that will ever understand or have a clue about we the so called middle class or poor people go threw on a daily basis. AC I think this will be a great story for you and the world to open thier eyes to. Great job, as always, CNN! All of you are doing a great job covering the convention AND the hurricane. No one does it better! Keep up the great work!